Join us for our 5th annual Global Prayer event. Yeru Bön Center and Latri Nyima Dakpa Rinpoche invite Bön practitioners and friends of Bön to participate in our fifth annual Global Prayer and Meditation event. Last year’s participation was well over 2700 people from all over the world. Majority were Bönpos, but we had soldiers and non Bönpos praying throughout the world. We received letters, photos and more from people around the world participating in this incredible event. This year’s global prayer event will be February 20, 2018, The birthday anniversary of Nyamed Shenrab Gyaltsen, the founder of sMenri Monastery, the main monastery of Bön. On this auspicious day, every prayer we pray is multiplied by 100,000. On that day, we ask all practitioners to pray and meditate for a minimum of one hour anytime between 7:00 p.m. – 9:00 p.m. within their time zones. Gather as a shangha, by yourself, in a private place or public. Lots of Tsokme’s/Sanghas met as a group, some had dinner together, some stayed quietly in their home and prayed. But all we ask is you devote one hour of your time between 7:00-8:00 p.m. dedicated to meditation and prayer for world peace. Peace for our governments, family, the ill, the soldiers, our children, those suffering and any other reason for prayer. Imagine, if our one hour of prayers can be felt worldwide as a blessing to others and to ourselves. What a wonderful feeling. Yeru Bön Center has already sent an official letter to the Yungdrung Bön Monastic Center, White House, The Office of His Holiness, the Dalai Lama and to Bön sangha’s around the world. 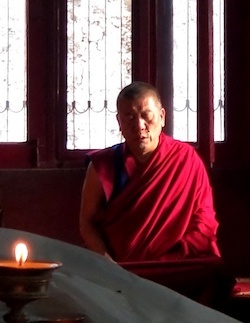 Rinpoche will release a special prayer to all registered participants the beginning of February. 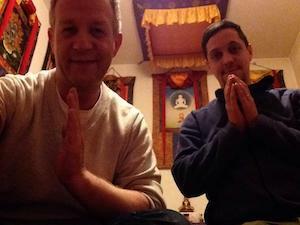 So this is how it works: Our global prayer/meditation event will begin at sMenri Monastery in Dolanji India. The Monastery, Geshes, Monks and Bön practitioners in that time zone will begin the global prayer event at 7:00 p.m. their time zone. Prayers and meditation will continue with the next time zone, (going West). until our prayers have gone full circle around the world. There is no fee for this event. We ask only that you register your participation and time zone by February 18, 2018. After you have registered your name or group name, Yeru Bön Center will send the list of participants to sMenri Monastery. A special blessing will be given to all participants. During your event, please feel free to post photos or messages of your gathering or meditation on Facebook or twitter, so everyone participating around the world can see you and your group gather, uniting all Bön practitioners for this spectacular 24 hour global event. Participation in all time zones will keep the Bön community. The power of prayer can change the world.